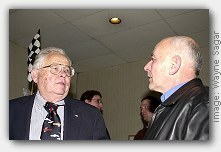 Editor's note: In 2002, the air racing community celebrated Dwight Thorn's life at the National Air Racing Group's (NAG) banquet. With Dwight's cooperation, we asked visitors to this site to submit questions to this great engine builder in an "Ask The Doctor" feature. The results of those questions and some of Dwight's answers to them are contained on this archived page from the "history books" of AAFO.COM. We invite you to celebrate Dwight's life by spending a few minutes or an hour or two to read these pages and listen to his words from that night in 2002. 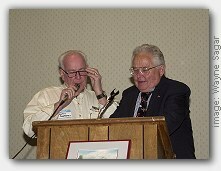 "At the first Reno Air Race," says Thorn, "the round engine triumphs. Mira Slovak and 'Miss Smirnoff' come in first. 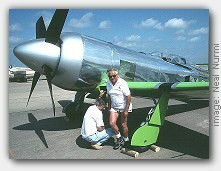 Bob Love had the fastest Mustang and Merlin in the field. Greenamyer may not have triumphed that year, but what a racer!" 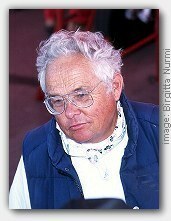 Greenamyer was disqualified in that initial race, because he didn't land at Sky Ranch as the rules required. None the less, he went on to win six of the next seven Reno Air Races in his F-8F Bearcat, "Conquest One!" 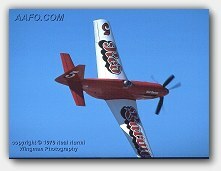 "...'Maytag' Wayne Adams**, dishes out of a turn in his P-51 and strikes the ground! He keeps on flying. Heavy damage to the scoop, but missed the prop!" There were multiple air races then, and according to Thorn, time seemed to fly quickly in between: "Bob Abrahms first trick Mustang runs in the Trans Florida race with no backfire screens. Two weeks later, we're at Las Vegas with Bardahl. Plenty of N20, carb door, but we're second again." One of Thorn's most incredible memories was the course line at the new Reno Air Race site: "We're at Reno-Stead for the first time in 1966. The pit line is directly in front of Al Redick's hangar. The course line is directly over the pit area! Wow!!! That didn't last long! Hell of a show! First blown Bardahl race engine. How can this be!? Darryl's Bearcat appears here to stay!" Thorn himself is about to move on. "Reno '67: the last year for the Bardahl Race 8, 'Challenger.' 7.5 pistons. N20." "Can you ask too much of a Merlin?," he asks rhetorically, "The answer is: yes! There's that Bearcat again  Darryl takes home another National Championship." "Reno '68," says Thorn: "...a change of horses. I go from Race 8 to Race 5, now known as the 'Miss RJ.' Aptly named, since the 'RJ' stands for 'Real Job'  which is flying  and interferes with racing!," he laughs. "A quasi-military paint scheme, Hoerner tips  Aeroproducts. Gave the Bear a real fight this time!" ...but still, the 'Bear' won. "Reno '69: my real job wasn't in the way anymore," says Thorn. "Jim Larsen's scheme  a new canopy  we took a stock canopy and turned it backwards. A pointed spinner. Oh, that paint scheme! White with a fire-red stripe, black scoop. It was tough! Also tough week at Reno! Pistons. A real bonzai engine change! Help from the other crews. Grabbing guys as they walked through the door! Next morning, engine in  but no banks!" The crew responds to an anxious pilot: "No Chuck  you can't race until we put the cowling on!" Sunday arrives and it's the "Mixture Linkage" this time. In brief, Thorn explains to the disappointed pilot: "Chuck, I forgot to tell you  the Bear is awesome on Sunday." 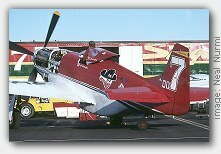 After all, Greenamyer had broken the World's Piston Engine Speed Record at Edwards AFB in August. Could his Bearcat be beaten? No crew could be blamed if they had their doubts. Thorn also notes the arrival of another racing plane: "And there's a new Bear on the scene  # 70, (Lyle Shelton's) 'Able Cat'. No one realized the start of such a long lasting force." The next year is a landmark in Reno Air Race history, as Thorn notes: "Reno, 1970: Race 77 was not yet in the hunt, but Darryl's gear hangs and a Mustang wins  # 64." Clay Lacy brings both the Merlin and the Mustang in at first place for Reno in 1970, Today, Lacy is still flying the purple people eater, Race 64, "Miss Van Nuys," to air shows here on the West Coast. "Reno '71," says Thorn, "Gunther (Balz) bites the bullet and commissions Race 5 as the 'Roto Finish Special.' Raced a stock Bear. To some folks, 'Roto Rooter,' but a pretty clean racing deal." Another year of frustration: "Rudder tab," says Thorn, who adds "Finish line Reno to Bogata. A disappointing third." Thorn adds more soon to be famous names and faces to the list: "Race 87 ("Miss Merced") emerges. Sherm Cooper. ADI by Kerch. Flame paint job. That's a race plane!" Miss Merced won't win Reno in 1971  that goes once again to Darryl Greenamyer, according to Thorn: "They lent the nitro to Darryl, he's first." Race 87 finishes "A smokin' second. New guy: 'Tipsy Miss' (and) J.R." Can this guy thrash or what!? Just the beginning." Thorn witnesses the historic "Thousand Mile Races" In and around the Reno events, Race 87 is the victor in two of three historic 1000 mile races held at Mojave and San Diego, California. Says Thorn: "At Mojave, the shootout is between Race 1 (Conquest One), Race 77 (The Able Cat) and Race 69 (Miss Candace). Bob Love, race in hand, dropped an intake valve." In the end, 'Miss Merced' not only outruns the fighters, but the "transports and bombers" as well. An eventful year follows for Thorn In 1972, a Mustang wins again  this time, Race 5, the 'Roto Finish Special,' with a Dwight Thorn motor and Gunther Balz at the controls. The celebration says it all for the team. According to Thorn: "For the next six years, we have a singular focus: Win Reno!" For Thorn and company, time marches on. Lyle Shelton and the Rare Bear arrive. The duels begin between Race 77 and the hybrids of Cliff Cummins' "Miss Candace," *** and Ed Browning's "Red Baron," which operates at first with a trusty Merlin engine, then makes a radical change to the Merlin's offspring, the Rolls Royce Griffon engine. Ken Burnstine follows with Jim Larsen's elegant design, the Merlin-powered "Miss Foxy Lady." Years later, that aircraft will win the National Championship as "Sumthin' Else," Race 6, with John Crocker at the controls. All through this period, says Thorn: "ole '97" (Note: Love's "The Oogahonk Special") is nipping at their heels. "But it was hard to get that Bear down," says Thorn. "That monster motor just ain't fair  an R-3350 with hundreds of pounds of N20!" "The sketches of what would become Tsunami are discovered on a table cloth at a Chinese Laundry. I don't think they were secret  Pete (Law)?" "Dave (Zeuschel) 'Imagineers' Race 84, 'Stiletto.' What an exercise in weight reduction is this hybrid Mustang! And it's fast!" 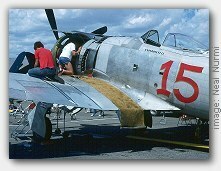 "Back in the era of Race 87, Kerch put forth the concept of mating the most powerful engine to the most refined air frame, i.e., the Pratt & Whitney R-4360 to the Sea Fury." Sanders Aircraft does just that, producing "Dreadnought," Race 8, and according to Thorn at the time: "it's unbeatable." "And the Rare Bear is rising from the ashes again," says Thorn, with "Jack Deboers, buckos Dave Cornell and 'Doctor Squeeze,' Greg Shaw." In Las Vegas, New Mexico, they set a new World's Piston Engine Speed Record (Note: over a 3KM course...) that stands to this day: 528.3 mph. Thorn witnesses the development of the all-new "Tsunami," along with the refinement of "Stiletto" and the appearance of the hybrid clones, "Dago Red" and "Strega." A long and victorious relationship begins with Bill "Tiger" Destefani. The new Mustangs "engage in a battle royal with the leviathans," says Thorn  Super Corsair, Rare Bear, Dreadnought and Furias. Ultimately to be joined by Race 10, "Critical Mass." "Remember the International Bakersfield Air Races?," asks Thorn. "Sandy used my van for an announcing stand. That fast start...the Bear turned about Delano. The duel between Stiletto and Strega..."
All memories to this Air Racing legend. Today, Thorn ponders Air Racing's uncertain future. For a while, there was the dream that was the Pond racer. Voodoo has made her presence known. "Shock Wave" remains an unknown, as do other projects, and the 100th Anniversary of Air Racing approaches in August, 2009, with only one race scheduled anywhere in the world: Reno. Darryl Greenamyer will soon return to Air Racing in the Sport Class. The former Unlimited National Champion will represent the Lancair contingent against the Thunder Mustangs of the Thunder Builders Group, and the new NemesisNXT currently under construction at Jon and Tricia Sharp's facility in Mojave, California. "Maybe the Sport Class is the future of Air Racing," says Thorn. "Maybe the warbirds should retire to the 'Vintage Class'?" "As for me, I'm for less all night flogs and more parties!" You've had one hell of a life in Air Racing, won many laurels for your pilots and teams along the way, and brought many a great memory to the fans standing in the pits and the grandstands watching those laurels being won. notes for a 1997 presentation at the National Air-Racing Group. balance of the recording is in high quality digital audio format.